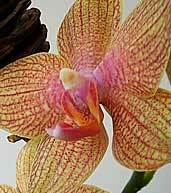 The magnificent stippling of crimson on this peerless Golden Yellow Phalaenopsis will demand a closer look from anyone entering the room. Beautifully complemented by a local artist's hand thrown, crackle finish volcanic clay vessel shown here, this magnificent epiphytic orchid prefers a north- or east-facing window and will require only slight changes in temperature for reblooming next season. 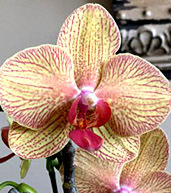 Welcome a potted Phalaenopsis into your home and enjoy its exotic beauty for many years to come. 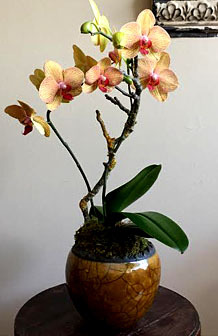 For other fine containers, view Orchid Containers.